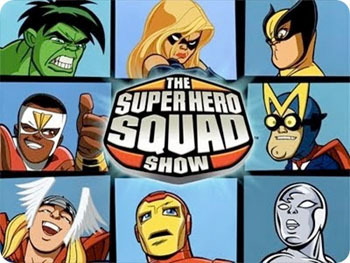 The Super Hero Squad Show: Volume 1 :: Quest for the Infinity Sword! Protecting Super Hero City from the wild, weird and wacky baddies of Villainville is hard work, but Iron Man, Wolverine, the Hulk, the Silver Surfer, Thor and the Falcon are always up for the job. Shouting Hero Up! each they go into battle on this brand-new DVD - Volume 1: Quest for the Infinity Sword, the Super Hero Squad must keep Dr. Doom and his gang from gathering pieces of the Infinity Sword ... or else he'll rule the universe. Luckily, there are plenty of Marvel Super Hero guest-stars willing and able to help. These brave heroes totally deliver the action – with plenty of laughs on the side! The Super Hero Squad Show features super-stylized versions of Marvel’s most popular characters (think Captain America, Silver Surfer, Thor, Hulk, Wolverine and Iron Man) - with a twist. The show features some of Hollywood's top voice talent, like Tom Kenny (a.k.a. Spongebob) as Iron Man, Captain America and M.O.D.O.K.). 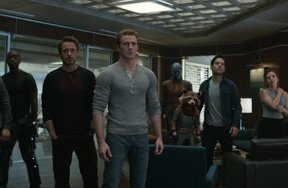 Plus, some pretty superstar guests have lent their voices to breathe life into tons of other characters, including Michelle Trachtenberg from Buffy the Vampire Slayer and Gossip Girl as the Valkyrie. And Lo ... A Pilot Shall Come!